Even though this thread is for discussing 2.0, 2.1, 4.1, 5.1, 6.1, 7.1 Speaker systems for PC, you could also post reviews for normal home theater sytems also. But the main focus is PC speakers. Ellavarodum ithoru van vijayamakkan apekshikkunnu. There are different brands like Creative, Altec Lansing, Bose, Logitech etc. So feel free to share your views. 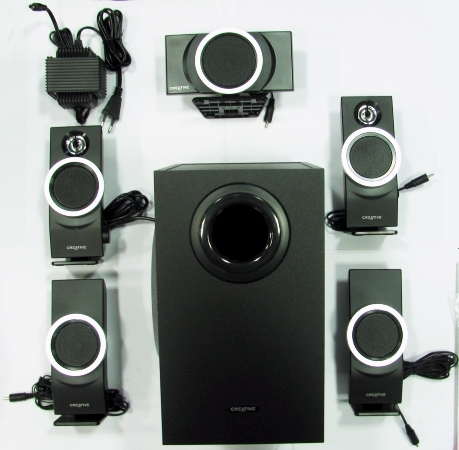 First someone please post a review for Creative Inspire T6100 5.1 surround system as i would like to buy one(not much choices available at the moment). Last edited by David; 07-04-2011 at 08:47 PM. Here is the image of T6100. 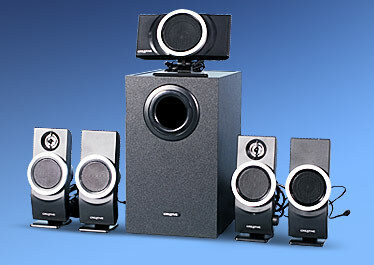 * Superb SubWoofer Range with Pure Base! No Distortion upto max.! * Bass Reflexes are great compared to my previous T6060 & AL2000. * Slim shaped Sub. Easy to accomodate than Cubic ones. * Quality tweeters on front cones. nothin about sound quality, just sum minor conz..
* the power LED bulb, a hi bright blue one on the left.fr seems annoying for me..
* i felt a lack of a wired remote! T6060type.. but it comes with a volume control on the front left speaker. i think , its normal for a computer speaker! Rating: 4.5 out of 5 <- a best buy audio gear for this price! @kumbidi Is the rear speaker volume loud as the front speakers? Also the rear speaker cable length is 4 meters, right? I only needs 4.5 m, so i could use a small length rca extension lead for that! Also thanks for the review. There are no other 5.1 systems available in the market at affordable price. Other brands like bose and jbl are not available and altec lansing will be over 10,000. Audioengine is usa only. need to import if needed. u r welcome! the rear n frnt speakers are almost balanced on speaker fill mode. On 6Ch output, only fx n bgms are routed via rear speakers. If the playout is a 5.1 source, then u cant feel the balance tones of rear speakers cos of effects! Im using Realtek HD audio panel to indpndly cntrl the channels. (soundcard is optional, im using onboard). And about the cables, it can be extended usin a Male-Female RCA cable. Better go for a high quality copper rca cable!.. ithum molil koduthathum thammil entha main difference sada use nu okke ee sadanam mathiyavumo ?? yeah, AL speakers are awesome.. also, creative 2.1'il bass/treable adjustments illa.. 5.1'il und, but subs'nte backil aanu..
njan Dolby SRS audio controller ittittund, athuvech adjust cheyyum..
athentha sambavam.. entaeyum creative 5.1 anu..